This project couple-of-city-blocks-wide project was an extension of my gallery installation of mine at the Keys That Fit window gallery on Telegraph Ave in Oakland. 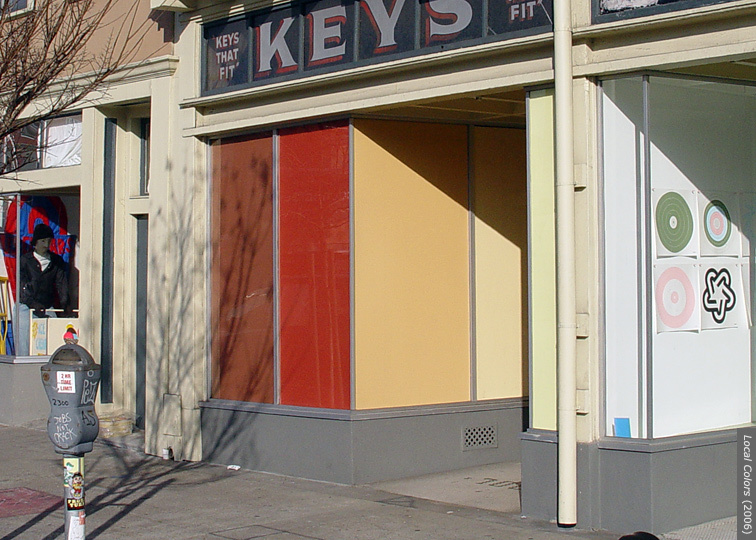 The part of the site-specific window installation consisted out of seven painted panels that were integrated into the old store-front architecture. Each painting was placed directly behind and was covering from the inside, one of the seven matching window panes of the gallery that were facing the street. Every panel was painted a different monochrome color; and each such color was 'sampled' from one of the surrounding buildings in the direct neighborhood. Because of the windows' glass layer the set of monochromes reflected the onlookers and their immediate context. (I was also thinking of and referring to Gerhard Richter's large colored mirrors, and wanted to apply that medium in a more ambiguous, site-specific, and interventionist approach). The whole project was inspired by my initial observations in this neighborhood. During my preparatory on-site research I was impressed by how rich in diversity but also how disconnected this little stretch of Oakland seemed to be. Along just two short city blocks you could find groups of homelesss individuals, as well as owners of brand new condominiums, along with residents living in cheaper rental apartment buildings. I met groups of 'black' and 'white' Americans, and of Chinese, Vietnamese, Korean, and East African immigrants. There was a small Vietnamese mom and pop neighborhood grocery, and a large regional Korean supermarket. An African American Christian church, and a Chinese Buddhist Termple. A couple of grassroots but mostly 'white' art initiatives and the global headquarters of Interplay, a play and theater related organization. There was a bar for African American gay people, a cultural cafe catering to a young and mostly white creative community, a historic and hip music club. A one dollar store and two different treatment centers for alcohol addictions. And so on ... People did not seem to talk or walk much on the street, they mostly dashed in and out their respective communities or destinations. There was some history of local drug related violence and residents advised me to stay away after dark from a parking lot behind a club. One police officer also warned me later not to get too involved with the homeless as he said they might turn out to be unstable or act in unpredictable ways and switch on me (; all went very well). So some stuff was definitely happening here but I felt relatively safe; located only four or five blocks from mayor Jerry Brown's apartment, in an area with a couple of new and exciting cultural initiatives, on one of the main historic thorough streets, and close to the edge of downtown. I found out different language groups often did not speak each other's tongues. The African American population unfortunately often appeared the least fortunate (and the least well-to-do seemed the most visible on-foot presence on the street) while Korean immigrants for instance seemed to do well. It's hard to see the more subtle complexities of a situation as a relative outsider and avoid generalizing but I made an effort to work with all 'local colors', to include all in the same general area, in a generally connective way beyond the cliches of divisions by skin color, race, nationality, sexual orientation, or economical status. As I see art as the creation of new meaning in the dialogue between oneself and the world, my intention was to --in seemingly simple and non-threatening ways-- invite more dialogue and inter-connection, in and through an artmaking process. During the preparation for and execution of this project I was a regular presence in the neighborhood. People would see me return regularly to their area over a period of three months and saw me converse with 'everybody' and I got to meet many people and got the cooperation of quite some. At first I got the attention of homeless and other street regulars who weren't used to see an outsider spend time on the sidewalks and I was asked what I was making photos of. They were checking me out but also willing to connect. In the course of the process I tried to introduce myself to as many local people as possible, including the homeless, and the residents, organizations, and small businesses. At certain locations I needed and got the cooperatiopn of different landlords to gain access to their appartment buildings and renters, and to be able to knock on their doors and/or leave flyers. My invitation to the local people at each address was to participate in the art project by choosing one (any) color, and putting a rectangular surface (of any size) with that chosen color behind their street-side windows. This way the neighborhood would become a live-in mosaic, a collectively created and shared artwork. And so it happened. The homeless people that participated chose a spot on a publicly used bulletin board, on the side of a closed off club or bar. Rectangular patches of different colors, materials, and sizes ended up appearing in many places, along my own colors behind the gallery windows. I pretty much knew all the people who participated and realized that sometimes very different persons who might never even have talked to each other sometimes ended up choosing the same colors. A subtle neighborhood mosaic of colors was created communally and made visible in a new way a network of presences in their shared place. It defined and reminded of the shared place in a new way. At the end of this project tours were organized in which participants would pass by the displayed markers and learn more about the area. One such tour, for local participants and residents only, included stops at some of the participants' addresses that had opened their doors for further introductions and enjoying drinks, snacks and chatter around the story of their chosen color and other things related to themselves or the neighborhood. We had such stops at a local pizza place run by a Brazilian couple, a treatment center for alcoholic men, the global headquarters for Interplay, a church and treatment center for women struggling with problems, and a young artists and crafters collective (Rock Paper Scissors). Several people that had never spoken to each other learned about shared interests and common grounds, and became familiar with for them unknown aspects in their immediate neighborhood. A renewed awareness and definition of the shared terrain, and the beginnings of new connections between normally distictly seperately operating people and groups were facilitated because of, and as a part of this art project. At the conclusion of this project I collaborated with artist and photographer Susannah Slocum. In her work she often brings together visual groupings of until-then seemingly unconnected situations, things, or people on the basis of something that they have in common. We created a series of still video portraits of a number of local people in front of their spot in the neighborhood; a work that we hope to present one day in this local setting. A public installation consisting out of a set of seven site-specific, monochrome acrylic paintings, integrated into the old storefront of the windows-only gallery. Interaction with many of the people and aspects of the neighborhood, over a period of three months in which I invited the neighborhood to participate with their own window installation with their own color patches of differeing sizes at their local addresses. Open neighborhood tours as well as one exclusively for local residents; the latter included visits insideand time for introductions and exchange at some of the local participating addresses. A series of still video portraits of participators in collaboration with artist Susannah Slocum.